New Zealand’s most beautiful natural attraction, Milford Sound is a remote treasure hidden deep within Fiordland National Park. Even though it can be hard to get to Milford Sound, it’s definitely worth the time and effort! If you visit Milford Sound on a day tour, then your driver guide will provide commentary as you travel. They will explain the history and geography of the region and give you local insight about this very special place. You can use the range of Milford Sound maps below to plan your New Zealand holiday itinerary and make sure you don’t miss out on this unforgettable destination. The 288 kilometre (178 mile) journey from Queenstown to Milford Sound is consistently rated one of the most beautiful drives in the world. 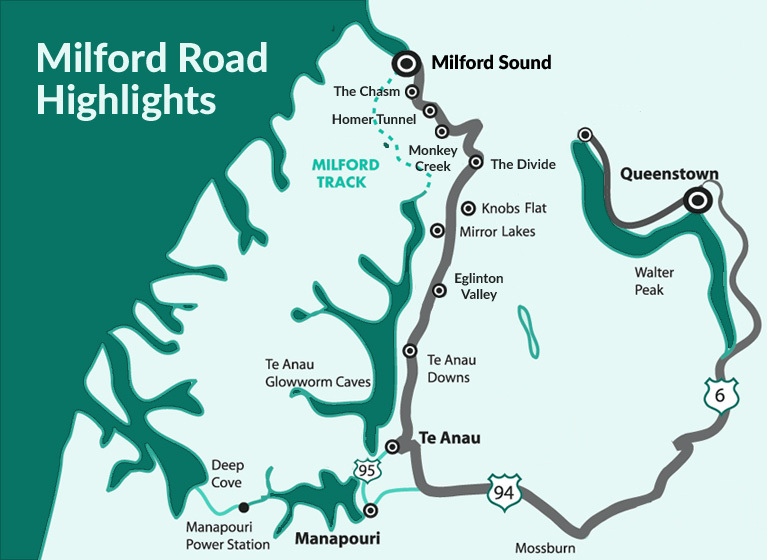 Here’s a map showing the Queenstown to Milford Sound distance and key places along the way including Te Anau, the Eglinton Valley, the Mirror Lakes, the Chasm and more. You can visit Milford Sound on a day tour from Queenstown or Te Anau. If you choose to drive to Milford Sound, you’ll need to plan your trip very carefully as it is a long journey in a very remote area with few facilities. Our Milford Road guide has more information about this top New Zealand scenic drive and the amazing sights you’ll see along the way. Find out more about how to get to Milford Sound. Once you arrive in Milford Sound, you’ll probably be planning to take a Milford Sound cruise to explore the fiord in all its natural glory. 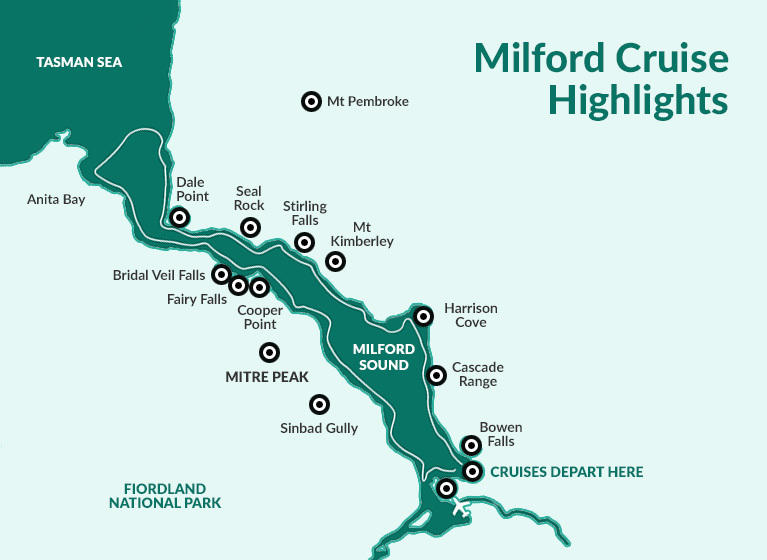 Here’s a cruise map of Milford Sound showing the key scenic points you’ll learn about during your cruise. These include waterfalls, mountain peaks, wildlife, facilities and general information. Find out more about these Milford Sound cruise highlights.